We’re sure that some of you will be green with envy when you see this Eltham acid etch full exposure pool surround! Nothing says Aussie summer much more than a brilliant outdoor entertaining area, complete with an amazing pool. The owners of this property chose Eltham acid etch full exposure to make the area stand out, as well as provide a safe surface for family and friends. When you’re hosting get togethers, or even just having some family pool time on a hot day, water can become a hazard. It is important that the surface is as accident-friendly as possible, with a non-slip surface that also looks the part – just like the Eltham acid etch full exposure outdoor area we recently finished. Acid Etch – or Exposed Aggregate – is the perfect way to get the most out of your existing or new concrete area. 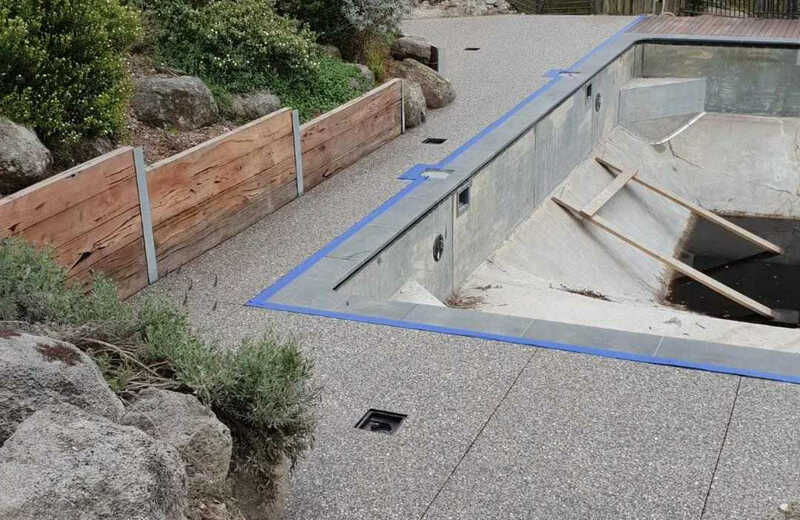 Acid etch results in a smooth, sand textured surface that is also non slip, so it is recommended for driveways, outdoor entertaining zones and pool surrounds. So, how does it work? The process involves washing concrete with acid, which opens the pores of the concrete and prepares the surface for its next treatment. The natural pebbled, textured look also fits in well with this Eltham property, which is set in one of the most beautiful green zones in Melbourne’s northern suburbs. Instead of a flat grey look, the colours that the acid etch treatment brought to the surface is a stunning feature, as well as practical. Do you have an outdoor area that could benefit from a facelift, or do you want to increase the safety of your surface without compromising on style? Get in touch with Eco Grind today, and find out how you can add an extra dimension to your outdoor living zone!